A valid fishing license is required. See License Requirements and Fees. From April 1 to September 30: Open to open water fishing under general law bag and length limits. The use of all legal forms of bait, artificial lures, and artificial flies are permitted. From October 1 to March 31: Closed to all fishing. Note: waters that are open to ice fishing as of March 31 in the north region will continue to be open from April 1 through Sunday, April 21. 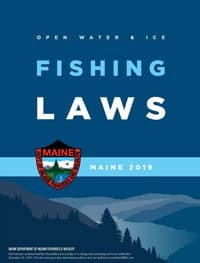 All rules and regulations for those waters that are already open to ice fishing in the north region will remain in effect. January 1 to December 31: Open to ice and open water fishing under general law bag and length limits. The use of all legal forms of bait, artificial lures, and artificial flies are permitted. From April 1 to August 15: Open to open water fishing under general law bag and length limits. The use of all legal forms of bait, artificial lures, and artificial flies are permitted. From August 16 to September 30: Open to open water fishing using artificial lures or flies only. 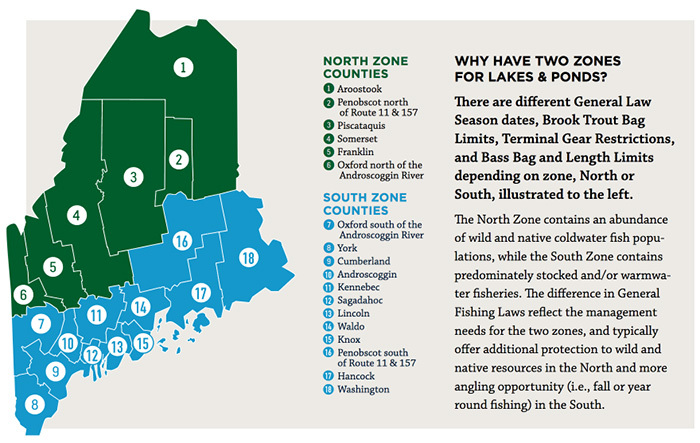 General law length and bag limits apply, except daily bag limit one landlocked salmon and one brook trout. The daily bag, possession and minimum length limits in the table below apply to all inland waters open to fishing. South Region: 2 fish No minimum length. Only 1 may exceed 14 inches.